AG80L - G & W Machinery Sales, Inc. 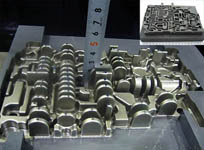 The AG80L Sinker EDM features Sodick’s Linear Motor Technology. 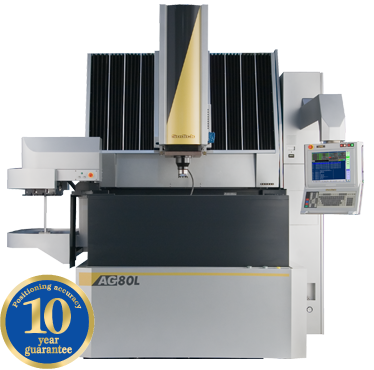 The AG80L is a precision machining solution for large sized aerospace, energy related parts, die/molds that require close tolerances, fine surface finishes and deep rib machining. The AG80L features simplified control mechanisms which provide a direct link between the drive and control. This ensures the fastest possible servo response time possible and optimal spark gaps at all times. The automatic three sided vertically sliding drop tank enables large workpieces to be easily loaded and unloaded. The AG80L Sinker EDM features Sodick’s Linear Motor Drives. Linear motor drives have been a perfect fit for CNC RAM EDMs (Electrical Discharge Machines). The linear motor’s fast 1,400”/min axis feed combined with high 1.2G acceleration creates its own natural and even flushing condition. The positioning accuracy of Sodick’s linear motors are guaranteed for 10 years on all Wire and Sinker EDMs.